For over five decades, the Philippines has been hounded by insurgencies from the northern-most tip of Cagayan province to the remotest islands of Tawi-Tawi. But thanks to the service of the Armed Forces of the Philippines (AFP), these insurgencies have always been kept at bay. Because of the fact that military men are always at the forefront during armed conflicts, being a soldier is a very dangerous job. In the history of the country, countless brave soldiers sacrificed their lives just so the Filipino people can live free. Their selfless service is always appreciated by the people. However, there are those who goes out of their way in showing respect and appreciation. This brings us to a mystery man only identified as Dexter Koh who bought over 200 soldiers Krispy Kreme doughnuts as a way of saying thanks. 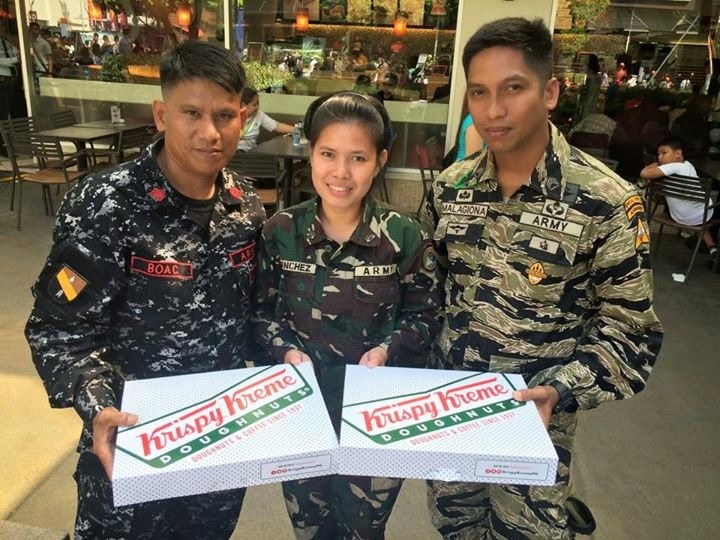 According to a Facebook post by a certain Captain Gemira Dy, soldiers were in Bonifacio Global City attending an event when a man who introduced himself as Dexter Koh offered to buy them doughnuts from a branch of Krispy Kreme at Bonifacio High Street. Dy wrote on Facebook, "Some soldiers were in a queue at Krispy Kreme BHS, suddenly a man who introduced himself as Dexter Koh asked them how many soldiers are there for the static display. One of them answered that about 200 Philippine Army soldiers were outside, when Dexter learned this, he ordered doughnuts for everyone which left both the KK crew and army troops astounded. Dexter just briefly paid for the doughnuts that we were not even able to take a photo with him. To Dexter, from the bottom of our hearts, we are very thankful for your gesture! Words cannot comprehend enough our gratitude for citizens like you!" Some of the soldiers holding boxes of donuts bought for them by a mystery man. Photo by Gemira Dy via Facebook. When asked by ABS-CBN, Dy said that a total of 12 boxes of donuts were distributed among the soldiers. A box of the donuts costs 395 pesos. If Dexter Koh bought 12 boxes, then that means he spent 4,740 pesos of his own money for the soldiers. To Dexter Koh, whoever you are, kudos to you. May your tribe increase. Thank you for going out of your way to show to our men in uniform that their services are highly appreciated.